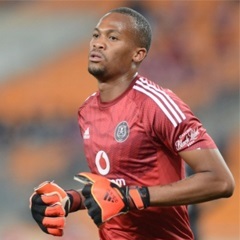 Cape Town - Orlando Pirates goalkeeper Brighton Mhlongo is growing in confidence after what was a tentative start to his tenure as the first-choice goalkeeper at the club last year. In his first match as custodian Mhlongo conceded two goals against SuperSport in the Telkom Knockout. That performance was followed by another failed exhibition against SuperSport United but this time it was a league fixture. For the Pirates football fraternity, the signs appeared to be ominous from the outset but the 24-year-old has since settled in his new role and looks forward to making more strides in his capacity as the first-choice goalkeeper at the Soweto giants. "I always believe that in due time all those clean-sheets will come," said Mhlongo after his strong showing during the goalless draw against Kaizer Chiefs last Saturday. "I always believe that God has perfect timing for everything, you know. The most important thing for me is keeping clean-sheets consecutively," added Mhlongo, who his raising the bar for the remainder of the current campaign. However, the young goalkeeper does not want to put himself under any unnecessary pressure either, as he feels that will also be detrimental to his cause this term. "I don’t want to be hard on myself and say ‘you know what, I can’t concede’. Every goalkeeper concedes," he added.
" Iker Casillas [Real Madrid goalkeeper] recently conceded four against Atletico Madrid, so every goalkeeper does concede, but the most important thing is picking yourself up from all those situations." Meanwhile, Pirates will look to return to winning form in the Absa Premiership when they host Chippa United at Orlando Stadium.